The concept of storing cheap, off-peak electricity to serve on-peak demand isn’t new. Technologies like compressed air and pumped storage hydro have been around for decades, providing operational flexibility as well as environmental and financial benefits. Energy storage is defined by the FERC in their 2016 Energy Storage NOPR as “a resource capable of receiving electric energy from the grid and storing it for later injection of electricity back to the grid regardless of where the resource is located on the electrical system.” In addition to pumped-storage hydro and compressed, other examples include air energy storage, flywheels and batteries. What was once just economically beneficial is becoming operationally critical as the flood of renewable generation onto the grid radically alters traditional load shapes. Rooftop solar, battery cars and utility-scale battery storage are game changers. In many parts of the country and especially in CAISO, renewable generation has fundamentally shifted the net load shape into something often described as a “duck curve”. 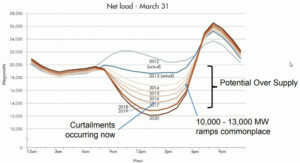 Net load is the demand forecast minus the forecasted generation from variable energy resources such as solar and wind. During the middle of the day, generation supply from solar can significantly drop the net load which is helpful in reducing dependence on fossil fuels, but can cause a system ramping problem in the morning and early evening as the sun sets. The chart below shows how the introduction of solar has shifted CAISO’s net load over time, creating the so-called “duck curve” (do you see it?). Conventional generation, such as natural gas peakers, now manage the steep ramps and frequency response challenges of renewables, but CAISO’s aggressive mandate for greenhouse gas reductions demands new solutions. There are high hopes that battery storage can eventually replace fossil fuels as a fast ramping, flexible alternative for both energy and ancillary services. A move in that direction has already begun. Since 2016, CAISO added 80 MW of battery generation for a total of around 150 MW, including North America’s largest lithium-ion facility operated by PCI customer San Diego Gas and Electric (SDGE). Now at only 3%, it’s a drop in the bucket of CAISO’s overall energy storage portfolio but, is poised to grow. CAISO recently mandated an additional 500 MW of distributed energy storage to its already market-leading goal of 1.3 GW of energy storage by 2021. You can now view the daily CAISO battery utilization on the CAISO website. Not to be overshadowed, New York recently topped this by mandating a 1.5 GW increase in energy storage by 2025. CAISO has a two-step settlement process for day-ahead and real-time markets in which participants submit demand and supply bids. The ESR energy bid curve is a hybrid containing both demand and supply (with negative bid volumes indicating a willingness to buy at the bid price and positives being sell signals). Traders also submit the State of Charge (SOC) which tells the ISO the initial condition for the battery, as well as bid prices for ancillary services such as regulation and spinning reserve. Then there’s the question of how much energy should be locked in for the day-ahead market versus keeping some available for potential real-time price spikes. Are your price forecasts dependable enough to forge a bidding strategy around them? 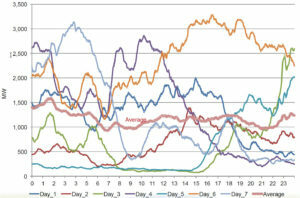 Do you want to play it safe in the day-ahead or risk it all with real-time volatility? PCI is developing a battery optimization module as part of its GenTrader platform that will help traders better understand how energy and ancillary price forecasts can be used to develop optimal bidding strategies. This is an exciting yet complicated development for utilities and PCI can help your organization navigate the potentially turbulent waters ahead in the areas of renewable and energy storage bidding and optimization.